The average cost of memory care in Thomasville is $3,600 per month. This is lower than the national median of $4,650. The city of Thomasville, which is home to nearly 19,000 residents, roughly 17 percent of whom are seniors, is located in Thomas County. The rate of seniors with Alzheimer's in Thomas County is higher than the national average of 10 percent, with about 12 percent of Medicare beneficiaries aged of 65 and over living with a diagnosis of Alzheimer's or dementia. Local families who are researching memory care options for their loved ones can find one memory care facility in the Thomasville region. Like most memory care units in Georgia, this facility shares a campus with an assisted living facility. In Georgia, Social Security benefits are not taxed at the state level. While other types of retirement income are taxable, those who are age 64 and over can claim a sizable deduction to offset the expense. This may allow more money to be put toward memory care in the Thomasville region. Yearly temperatures in Thomasville vary between 43 degrees and 91 degrees. Summers in this city are long, running from mid-May to late-September, and they are very warm and humid. The cold seasons are relatively short and last from December 1 to February 24. The region receives virtually no snow, which may make year-round travel to the local memory care facility easy for families. The overall crime rate in Thomasville is high, with the city being rated safer than just 4 percent of U.S. cities of all sizes and 11 percent of Georgia cities. Its crime rate is considerably higher than that of comparably sized cities in the nation. Families may want to inquire about what safety measures are taken by the memory care facility they choose for their loved one. The overall cost of living in Thomasville is about 15 percent lower than the U.S. average, which may make the city a good option for families with tight memory care budgets. Healthcare costs in this city are high, however, coming in about 25 percent higher than the cost of health care in the nation as a whole. Memory Care costs in Thomasville start around $3,600 per month on average, while the nationwide average cost of memory care is $4,781 per month. To see a list of free memory care resources in Thomasville, please visit our Assisted Living in Georgia page. 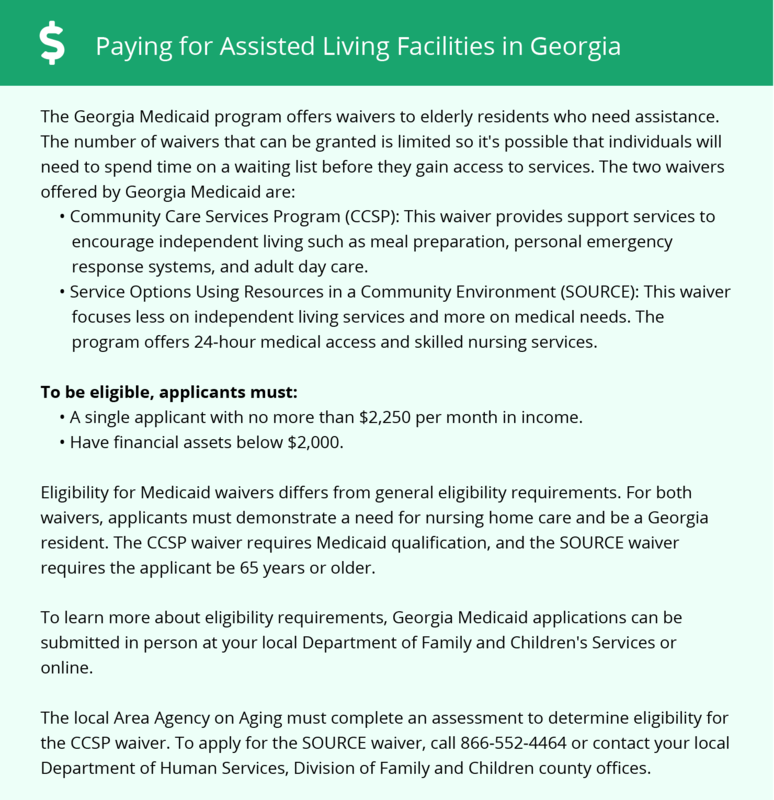 Thomasville-area assisted living communities must adhere to the comprehensive set of state laws and regulations that all assisted living communities in Georgia are required to follow. Visit our Memory Care in Georgia page for more information about these laws.